Custom account-based solutions company Snapper was creating an online concessions payment program for local students and needed a way to enhance the security of their information in the public cloud. The solution had to further protect the associated payment details stored in Amazon Simple Storage Service (Amazon S3) against malware and threats. Snapper chose Symantec Cloud Workload Protection for Storage for its advanced malware protection and elastic scalability that takes advantage of AWS’ native capabilities. 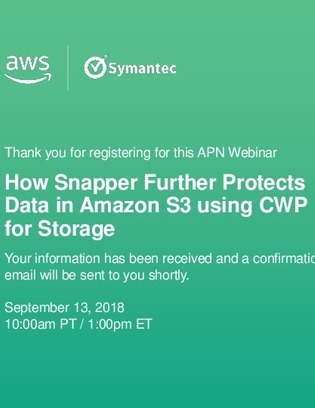 Tune into this webinar on September 13, 2018 (10:00am PT / 1:00pm ET) to learn how CWP for Storage consistently and reliably protects the data stored in your Amazon S3 buckets.